How does damn near three quarters of a million random read IOPS grab you? 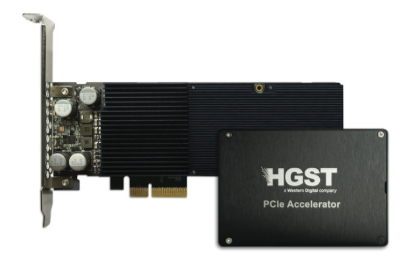 HGST is at last shipping its NVMe Ultrastar SN100 PCI flash card, first announced seven months ago. It delivers 310,000 mixed (70:30) read:write IOPS. HFST also has its Flash Software Suite and Device Manager software that work with the SN100 to provide clustering, scalability, high availability and manageability for server-side flash configurations. The random read speed is the headline figure. EMC’s VFCache delivers 715,000 so it beats that. SanDisk’s ioDrive 2 Duo recorded 700,000; pipped also. A Micron P420m boasts 750,000 and Samsung’s 3D V-NAND SM1715 does 750,000 random read 4K IOPS, and has better endurance at 10 full drive writes a day for 5 years. Both just beat the Ultrastar SN100. The NVMe aspect means standard driver code can be used instead of a PCIe driver specific to the SN100.